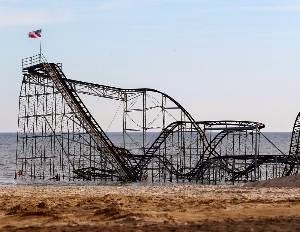 In response to the widespread property and environmental damage left behind by Superstore Sandy in the fall of 2012, the New Jersey Department of Environmental Protection (DEP) instituted numerous emergency amendments to existing regulations covering flood hazard areas and coastal management and coastal permits. Based on lessons learned from the Sandy rebuilding experience, the DEP decided this year to "consolidate the Coastal Permit Program Rules and the Coastal Zone Management rules into one chapter and to make other changes intended to further encourage appropriate redevelopment of more resilient coastal communities." Public comment on the revised rule, which was the subject of three public hearings in June and July, ended on August 1. But, spurred on by environmental groups that have criticized the revision, the State Senate's Environment and Energy Committee is taking another bite at the apple on Monday, August 11 at a 10 a.m. hearing in Trenton. New Jersey Future complains that "instead of providing greater protections, the rule increases exposure to risk." It focuses on two provisions. "The first allows for more development in high-risk areas; and the second permits more non-water-dependent uses such as restaurants at marinas, which will allow more businesses in dangerous locations and threaten sensitive coastal habitats." Clean Ocean Action likes the fact that the proposal would change the definition of “dredged material” to make it clear that that it is not a solid waste under the Solid Waste rules. "This will enable increased beneficial use of dredged materials for beach protection, marsh creation, capping of contaminated soils or sediments, and other projects, as long as the material meets certain criteria," COA says. But the organization objects to another provision that allow permit by certification for bulkhead reconstruction and recreational dock and pier construction in lagoons. While conceding that the change will streamline the permitting process for homeowners and businesses, COA fears "that it also eliminates much of the oversight on these types of projects, and fails to encourage natural living shorelines as alternatives." It will be interesting to see whether the DEP testifies on Monday in defense of its proposed regulatory change. The department is under no obligation to do so, and can argue that the public had ample opportunity to comment at the public hearings. EnviroPolitics will attend the meeting and let you know of the outcome.